I am totally stealing this, but I really love the idea. 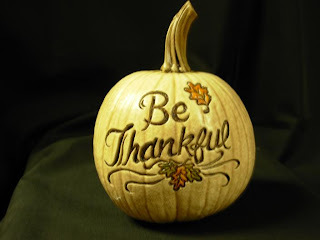 A lot of people seem to be planning to post one thing they are thankful for each day this month. Although I don't think I'll necessarily post something I'm thankful for each day (although Thankful Thursday has a nice ring to it), I think the concept is really nice. There are so many things I am thankful for, each and every day. A majority of those things center around my family. I have the most supportive and wonderful people in my life. My parents do so much to help out, and are constantly looking for more. My CSB takes care of ... well, he seems to take care of everything. I don't even know how to begin to thank him. I know it seems cliche, but we should all take the time to be thankful for the little things all the time. In every "bad" day, there are brief moments of laughs and smiles, and those are the moments we need to take away from the day. When you fall into bed at night, do your best not to think of the worries and troubles from the day, or whatever might be coming tomorrow, but fall asleep remembering the few laughs you were able to pull from that day. Live well, laugh well, love well. Be thankful for something every day.